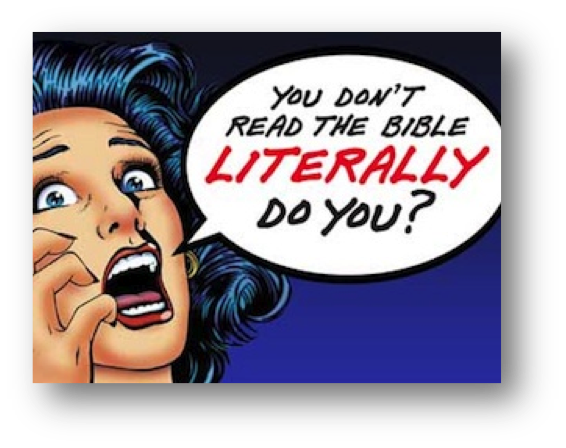 Question of the Month - Should you take the Bible literally? People often use words in ways that convey meanings other than what is intended. In many cases, you might clearly know what the person meant, even though they stated something incorrectly and sometimes even conveyed the exact opposite message. Personally, one of my favorite examples came from a television prophecy expert who was trying to express how exciting the Bible is and how much he trusted it. After sharing a few passages from Scripture and some evidences for its Divine inspiration, he emphatically said, “The Bible is literally unbelievable!” He obviously meant he thought the Bible was incredible and absolutely amazing, but if we took him at his word, he was saying you cannot believe the Bible! He didn’t literally mean literally! The word “literally” is fairly often used inappropriately. For instance, in referring to sitting through an extremely long, boring lecture, someone might say, “I literally died in class today. The professor just went on and on and on!” In reality, they meant they “figuratively” died. Likewise, a very common claim is “You can’t take the Bible literally.” When you hear people saying this, it is frequently because their beliefs and desires conflict with what is found in Scripture, and the easiest way to remove the contention is to say that those passages don’t really mean what they say. This dismissal allows them to continue to think what they want to think and live how they want to live, without anyone being able to use the Bible to judge them. When someone (generally a skeptic of Christianity) accuses me of taking the Bible literally, my reply is always, “You are making an incorrect assumption. I actually do NOT take the Bible literally.” This response always surprises them. Then I offer further clarification. “I take it contextually.” No one, before reading a book, decides to take everything written within its pages literally or figuratively. We make that decision as we read each section, relying on the context of any given passage to help us decide which approach is appropriate. It’s no different with the Bible, which actually contains numerous styles of writing, including historical narrative, poetry, songs, proverbs, prophecy, and personal letters. Even within each of these styles, you find different types of word and phrase usages, such as hyperbole, symbolism, metaphors, similes, allusions, alliterations, anthropomorphisms, idioms, and phenomenological language among others. Regarding the creation vs evolution controversy, some Christians claim the Genesis creation account is just poetry and was never meant to be taken literally. This idea generally comes from those Christians who, for whatever reason, have become convinced evolution is a fact; and consequently, it must be accounted for when reading Scripture. Their conviction often comes not from personal, in-depth knowledge of the subject but rather from assuming that somehow it’s been proven and “all the smart people accept it.” They feel their only options are to (a) believe in evolution and be counted among the “smart people” or (b) blindly believe the Bible (ignoring discoveries of modern science) and be considered part of the great unwashed religious masses who don’t live in the real world and know nothing about science. Psalm 91:4 – “He shall cover you with His feathers, And under His wings you shall take refuge…” This passage is obviously poetic, not intending to teach that God actually has feathers and wings. These references are symbolic of God’s provision of protection for those who trust in Him. John 4:24 tells us that God is a spirit. Therefore, we know for sure that none of the passages in the Bible referring to His “hands”, “feet” or “eyes” are meant to be taken literally. This is an example of anthropomorphism… describing God in human terms. Revelation 1:12 – “Then I turned to see the voice that was speaking to me, and on turning I saw seven golden lampstands.” Reading this passage in an isolated manner, you wouldn’t know what the lampstands were for sure, but you would probably view them as actual lampstands. However, later in the same chapter (Rev 1:20) it is explained that the seven lampstands, symbolically, are actually seven churches. In both of these examples the context (immediate or greater) clarifies how each passage should be read. The writing style of the Genesis creation account is literal historical Hebrew narrative. It was given to the Hebrews (i.e. the Israelites, also known as Jews), and they understood it to be literal history. He is saying if you just go by what Scripture actually says, you would conclude that God created everything in six literal days. However, when you take modern science into account (which he feels in imperative), you realize you can’t accept it that way. Therefore, it must not be literal. This interpretation is what’s known as “eisegesis”, in which you allow outside ideas and opinions to be the driving force behind your understanding of Scripture, rather than “exegesis”, which focuses on using the text itself to drive your comprehension. The overall message of this brief article is that we should read and interpret Scripture according to its grammatical context and then use what we learn to properly understand the world around us and our relationship to our Creator, rather than starting with our own opinions, desires, and preferences and subsequently using those to force the biblical narrative to comport. As with all of our other articles, much more could be said about this, but if you have any questions related to this month’s article or any other issue, please don’t hesitate to contact us!